IntelliFlo Variable Speed pumps combine variable drive technology, onboard digital intelligence, and permanent magnet motors (used in hybrid cars) to reduce pump-related energy costs by up to 90%. The new IntelliFlo VS+SVRS model is the first swimming pool pump to feature a built-in Safety Vacuum Release System that detects drain blockage and automatically shuts the pump off. *Savings based on comparison pump running between 6 and 12 hours per day at the national average of 15 cents/kilowatt hour in a 20,000 gallon pool. Actual savings may vary based on plumbing size and length, pump model, service factor, flow rates, and other hydraulic factors. 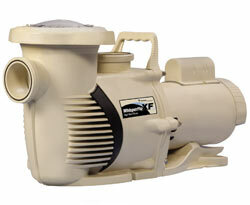 The SuperFlo® Pumps pumps are specifically designed to be the best choice for a variety of inground pools. 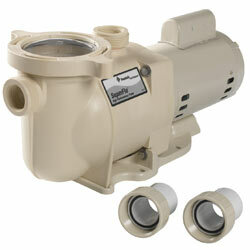 SuperFlo features thick walled body parts, a heavy-duty 56 square flange motor, and highly engineered hydraulics. SuperFlo’s silent running capability and small footprint allow it to easily drop into a compact equipment pad. 40% glass-filled thermoplastic with the Cam & Ramp™ “see thru” lid design. Self-priming, high flow with patented Funnel-Flo diffusers. 2 in. suction and discharge ports. 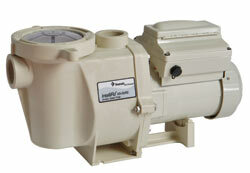 Motor features threaded shaft and durable commercial duty 56 frame motor with NEMA square flange. 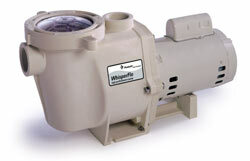 The new WhisperFloXF™ pool pump was developed using the most advanced engineering tools available — CFD (Computational Fluid Dynamics) and FEA (Finite Element Analysis). The proprietary impeller design delivers a higher level of precision concentricity for increased efficiency. The proprietary hydraulic isolator smooths the water flow inside the volute, raising the efficiency even higher. With capabilities in excess of 200 gpm, WhisperFloXF is an ideal choice for many residential and commercial applications; especially those involving water features, negative edges and slides. The Highest Water Clarity with the Lowest Amount of Fuss. 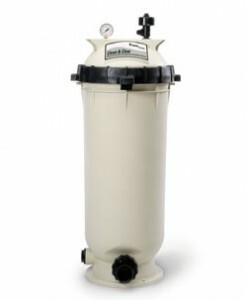 Quad D.E.® Filters combine the finest filtration available for the most sparkling clear water with the convenience and easy-cleaning features usually found only in a cartridge filter. Four easily accessible and removable D.E. cartridges simplify maintenance and save time. An Eco Select™ Brand Product: Water flows very efficiently through Quad D.E.® Filters allowing the use of smaller pumps or lower pump speeds to minimize energy use. And when consumers rinse cartridges rather than backwash, they can significantly reduce water use, too. D.E. is historically the media of choice for the designers of some of the largest and most beautiful pools in the world. It is now more practical for all backyard pools as well. System:3 brings you the proven performance of Sta-Rite’s diatomaceous earth media in the world’s safest and easiest-to-operate filter. The greater cycle times and minimized maintenance of the System:3, coupled with Sta-Rite’s superior grid system, gives you the finest D.E. filter available. So clean. So clear. So easy. 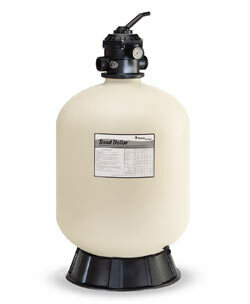 Sand Dollar® Top Mount Filters are the perfect high performance sand filters. It’s incredibly simple to operate and maintain, and it’s built with long-term reliability in mind. 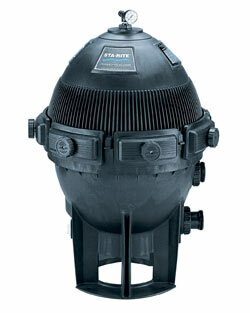 Plus, its highly efficient design provides all the clean, crystal clear water your pool requires, year after year. 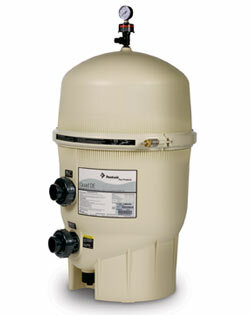 Sand Dollar® Top Mount Filters with ClearPro Technology®, remove particles up to five times smaller than traditional sand filters well below what your eye can detect for water that truly sparkles with clarity. The ClearPro secret is a proprietary, porous tube that water must pass through before re-entering the pool. It creates a final barrier to the very smallest particles that sand cannot trap, including the finest dust particles, algae and pollens. For residential inground or aboveground swimming pools requiring turnover through 59,000 gallons, at flow rates up to 20 GPM for 8 to 10 hours. 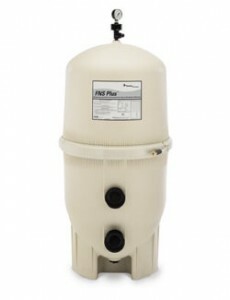 Permanent media high rate sand filters in 15″, 17″, 20″, 24″ and 30″ diameter models accommodate large and small pools, offering the best combination of economy, performance, durability and ease of maintenance. 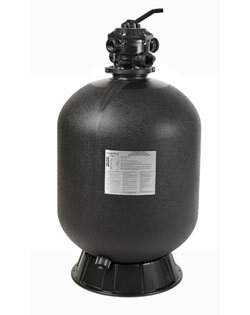 Corrosion resistant, one-piece, extra-thick molded polyethylene tank assures long service life. Top-mounted, corrosion-resistant multiport selector valve included. Also includes a convenient tank winterizing drain and continuous air relief system.